If you are reading this, you are probably wondering why an article in a 2008 August issue of Fortune called High Performance Computing "The New Secret Weapon." I decided to find my own reasons why HPC deserved the titled, and here I outline 2 reasons. 1) HPC gives you a competitive edge. PING, a manufacturer of high-end golf equipment, reduced their simulation times from 10 hours to 20 minutes by simply switching from regular desktops to HPC machines. Source. Other companies that have obtained numerous competitive advantages from HPC include Boeing, Dana Holding, Ford, Goodyear, Ping, and Whirlpool. 2) It is easy to implement HPC, and it is just a matter of addressing the top 3 barriers to HPC. According to a survey done by Compete, Council on Competitiveness, there are 3 barriers to HPC: Lack of application software, lack of sufficient talent, and cost constraints. Fortunately these barriers can easily addressed. The lack of application software: For Marc and MSC Nastran users, yes, these two FEA products can take advantage of HPC hardware. As for other software products, it would be best to contact their developers and incquire. The talent barrier: When moving into HPC, you will be new to the HPC features in your software and the physical HPC hardware. There are many engineering services teams and system vendors that would jump at the chance to make sure you and your team have the right amount of knowledge to perform your studies. Cost Constraints: Today, HPC machines are competitively priced or you can reserve HPC hardware from Universities and other institutions. Ultimately, HPC is within your reach, it just takes careful research into this investment. Just some last words, you can watch a presentation by PING describing their HPC success on Youtube. 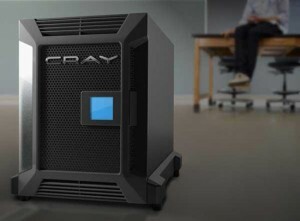 Normally when one thinks of HPC, you think of a large room with howling machines, but today you can have an HPC machine that sit next to your desk. This machine is a Cray CX1 by the way.